Shop kids fashion for all occasions featuring top brands such as Ted Baker, Monsoon and many more with up to 30% off. Shop electrical goods for your home including household appliances, Beauty electricals, Televisions & Audio and much more with up to 50% off. Where do I use my Debenhams voucher code? On this page, below your items, you will find the promotional code box. Enter your code here and click apply. "Shop in the sales. Debenhams is well known for its 'Blue Cross' sale, which occurs at various times throughout the year and normally offers a discount of up to 50% off. It's also worth remembering that rival department store John Lewis has a history of price-matching Debenhams like-for-like on sale items." "Free Click & Collect for orders over £20. If you're spending more that £20 online, you can collect from a Debenhams store for free. Click and collect for orders under £20 cost £2. If you order by 9pm, your items should be available from 12pm the next day." The UK’s number one department store, with shops on every corner and a fantastic website filled with high-quality British brands and tonnes of offers and deals- Debenhams is the ideal place for all your family’s necessities at affordable prices. Discover fashion for women, men, and children including dresses, suits, shoes and boots, rompers, lingerie, accessories and nightwear from well-loved brands like Ted Baker, Calvin Klein, and Fred Perry. Browse through must-have beauty products from names like Urban Decay, Tom Ford, Chanel, Benefit, MAC Cosmetics, Estee Lauder and much more, and even explore wedding wear, gifts and accessories to make your big day extra special, yet extremely economical. Whether you’re redecorating your home with new furniture and homeware, kitting the kids out with all their back to school goods or keeping up to date with the latest technology and electricals, you can do so at Debenhams. And with a handy offers section, filled with sales and discounts, you can do so for less. A trusted resident of the British high street since 1778, Debenhams’ department stores have always been known for delivering great value for money on must-have brands. Find copious amounts of percentage discounts and deals under the dedicated ‘offers’ section on the Debenhams website and save money on everything from women’s fashion to homewares. Another way to enjoy instant savings at Debenhams is via their Blue Cross Sale that offers flash sales and huge discounts on beauty products, designer clothing and much, much more. Arriving at various points throughout the year, the Blue Cross Sale is the perfect way to find all your seasonal must-haves for the whole family for less. You can always browse our discounts and voucher codes too to save yourself, even more, money on your order at Debenhams. And remember, if your basket total is over £20, you can click and collect for free, and if it’s over £45, home delivery is free too. 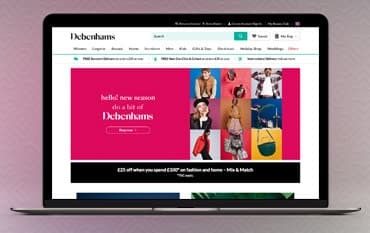 As well as a dedicated offers section filled with sales and discounts, Debenhams regularly offer discounted products as part of the main sale on their homepage. These sales can be on various items and accessories across the Debenhams site including beauty and fragrance, handbags, women’s wear and designer clothing. Each sale has a different name (such as the spectacular event) and comes at various points throughout the year to make sure you can always grab a bargain. To be the first to know about these frequent sales, sign up to the Debenhams newsletter for the latest news and updates, delivered straight to your inbox. Whether you’re dressing for a special occasion like a wedding or Christmas ball, getting dolled up for a night out with friends, or dressing down in something comfy for everyday wear, you are guaranteed to find a dress that suits your fashion requirements at Debenhams. Shop from trendy new arrivals, summery maxi dresses, elegant evening dresses, flashy party and going out dresses and even smart and sophisticated work dresses. And that’s not all, with wrap dresses, tea dresses and a range of stunning wedding and bridesmaid dresses, there’s no occasion that you can’t dress to impress for when shopping at Debenhams. If you’re working on a budget, there are items for you too, with dresses under £30 and an offers section located on the homepage featuring plenty of dresses at reduced prices. Discover gorgeous gowns from names like Phase Eight, Wallis, Dorothy Perkins, Monsoon and Oasis, all at low-cost prices, and head out in style in your dress from Debenhams. If for any reason you are not happy with your Debenhams purchase, you can receive a full refund or exchange within 28 days of delivery or collection. Find details on how to return your order. To find details and opening times for your nearest Debenhams store use the Store Locator. Find all customer service details here. Debenhams is a leading British department store, with more than 200 years of experience on our high streets - not only is it a beloved household name, known for providing everything that you and your family could possibly need, it’s also extremely affordable and great value for money, despite being synonymous with both quality and style. Why not use our Debenhams Promotional Codes to save even more money on your purchase? With stores all over the UK and a website stocked with everything from fashion to furniture to flowers, Debenhams is the number one place for all your must-have home essentials, everyday commodities, and latest on-trend luxuries. We are constantly on the hunt for first order Discount Codes for Debenhams to help you with your money saving. Our experts check dozens of sites for secret codes including NHS discounts, student sites & social media channels saving you time & money!